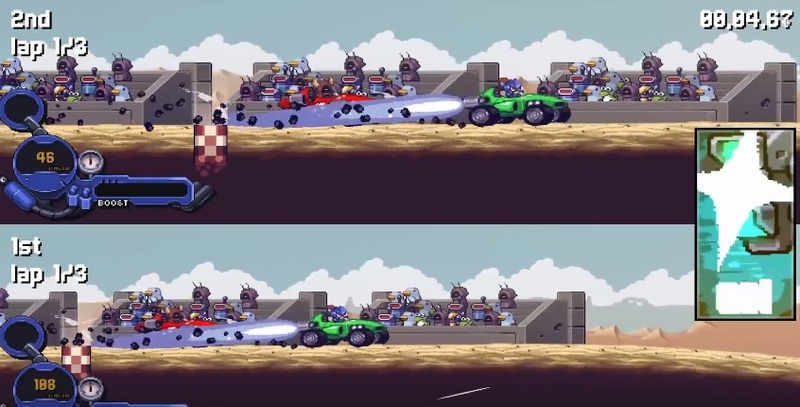 It's not everyday you see a new 2D side-scrolling racer pop up (outside of the mobile platform anyway). So I'm happy to announce that developer TurtleBlaze have launched their retro racer on Steam's Early Access programme. Intergalactic Road Warriors is described as a mix between Mario Kart, the original Sonic the Hedgehog games and a dash of Mad Max. The version currently on Early Access is an alpha build which has taken two months to develop by the two-man team. You can race with up to three friends or bots and they're several different powerups included. TurtleBlaze are currently working on adding more content to the side-scrolling combat racer with new tracks, customisable car parts, a single player campaign, and more powerups in the works. TurtleBlaze are also looking to add a track editor and online multiplayer although this very much hinges on whether or not they have enough funding and development time. You can currently purchase the Early Access version of Intergalactic Road Warriors on Steam for £5.99.